I realize there are many, many tiling tutorials floating around out there in the blogosphere, and this is not one of them. I don’t consider myself enough of a tiling expert (not even close!) to share a full tutorial. 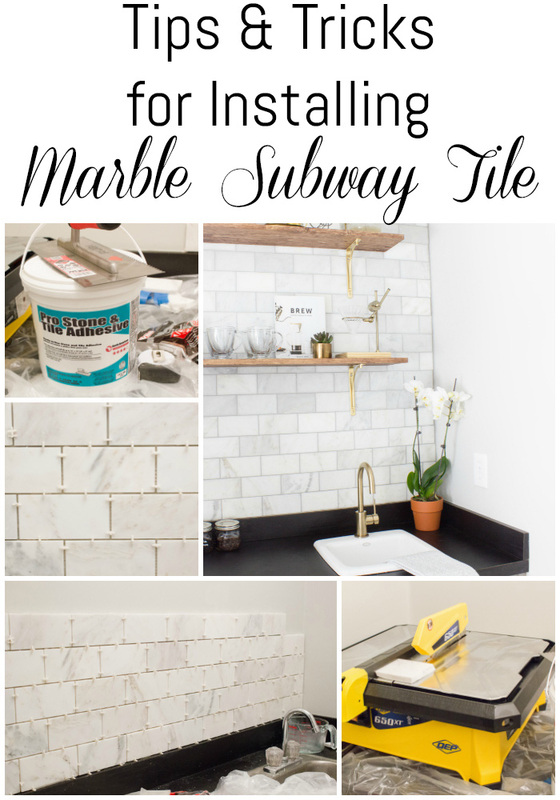 But this was my first time tiling, and I learned a thing or two, so I thought I could at least share some tips and tricks for installing marble subway tile as well as sources for all of the materials I used when I tiled the wall in our brand new coffee bar. Let’s get the obvious tips out of the way first. Make sure the wall is thoroughly clean and free of dust, dirt, and debris. Make sure your tile is level. First of all, it’s very important to ensure that you are working with a level surface. Luckily our countertop was level so it worked fine, but sometimes that isn’t the case, especially if your home has settled and the floors are no longer level. Check periodically to make sure everything is level along the way. Crooked rows of tile are no bueno! Mark the center of your wall. I drew a vertical line down the wall with a pencil just to have a reference point for where “center” should be. Buy a tile wet saw. You don’t need anything fancy, but I found that it made more sense to purchase the tile saw rather than rent one since it ended up costing the same in the end. This also allowed me to take my time with the project rather than rushing through it in a day or two since you pay by the day for rental. I bought this one. For marble tile, you have to have a diamond blade to cut through it, and only a wet saw will work. I had never used one before, and it was actually much easier than I thought it would be. It sounds a bit scary if you’re just starting out, but it isn’t. Account for spacers when you are measuring and planning your layout. I used 1/8″ spacers, and I had to account for this when I was measuring for my cuts. 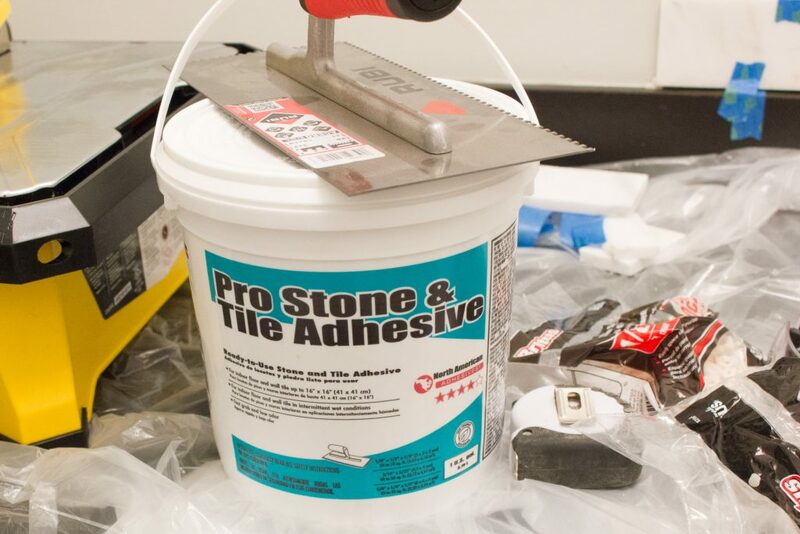 Before you attach with thin set, dry fit your tile first to make sure it’s cut to the right size. I found painter’s tape to be very helpful for this. I recommend pre-mixed thin set and pre-mixed grout for beginners. I’ve never mixed my own, so I can’t comment on that experience but I will say that for a beginner, pre-mixed is the way to go! It’s a timesaver and I found it easy to work with. You will need to caulk the perimeter of whatever you are tiling. Grout will not adhere between the tile and wall or the tile and ceiling. It will only work between tile. For the edges around the perimeter you will need to caulk. Since I used colored grout, I had to use matching caulk. Luckily, the brand of grout I used (Mapei) makes a color-matched caulk. This is pretty obvious, but tiling is a messy project, particularly when you are attempting to tile a vertical surface like I was. Cover everything in plastic drop cloths and tape it down to secure it. Otherwise, you will be chipping away at dried thin set and grout, and you don’t want to ruin countertops, floors, or fixtures. Expect a lot of dust. 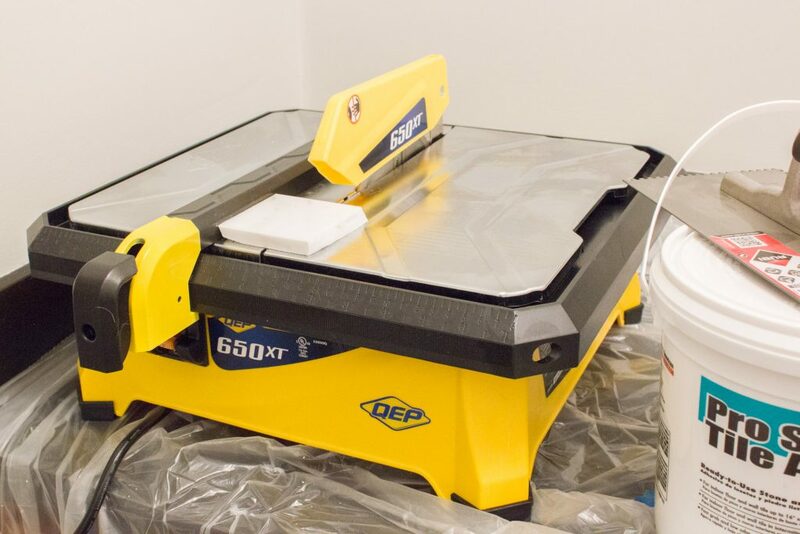 Cutting marble creates a lot of dust, so be sure to lay drop cloths and protect your surroundings. You can use painter’s tape to protect the ceiling, walls, and in my case, the countertop. Peel away the tape before the thin set dries and you’ll have a crisp line. You can do the same when grouting and caulking. Don’t skimp on the spacers. Use at least two tile spacers per side, per tile. 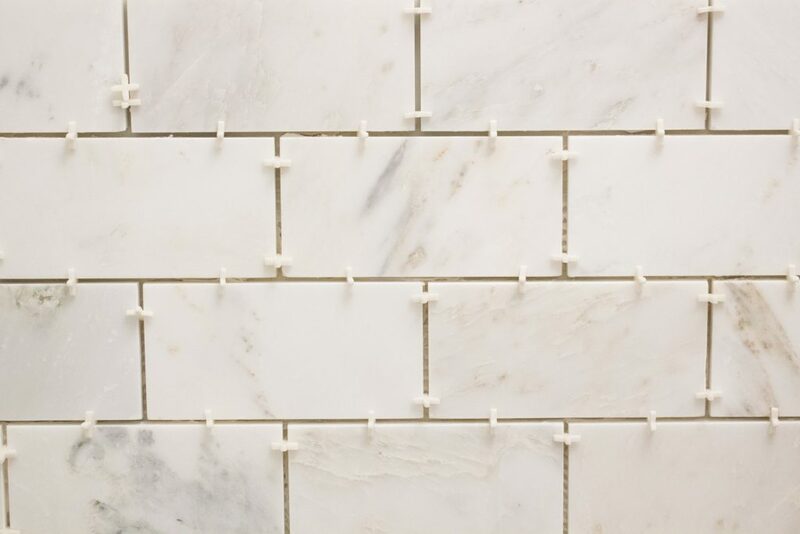 If you only use one per side, the tile tends to settle and you could end up with crooked lines. When attaching tile in tight spaces (right next to the wall, ceiling, etc.) 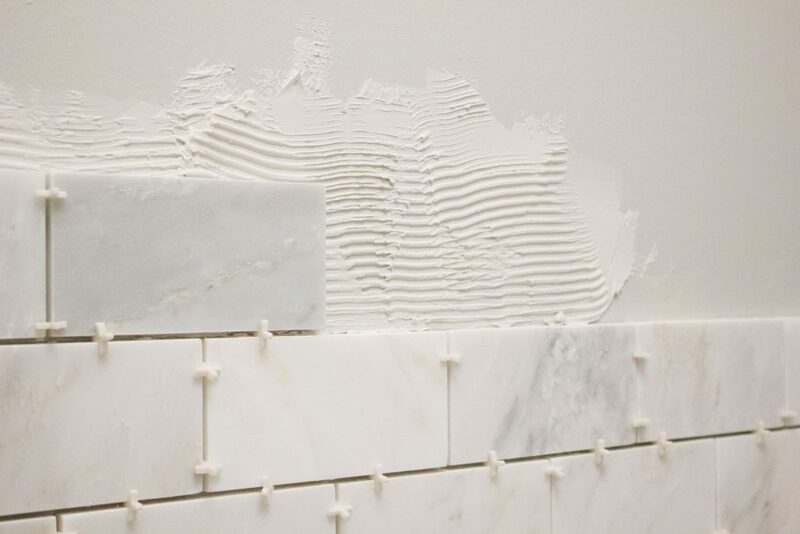 you can “butter” the backs of the tiles rather than trying to apply thin set to a tiny section of the wall. 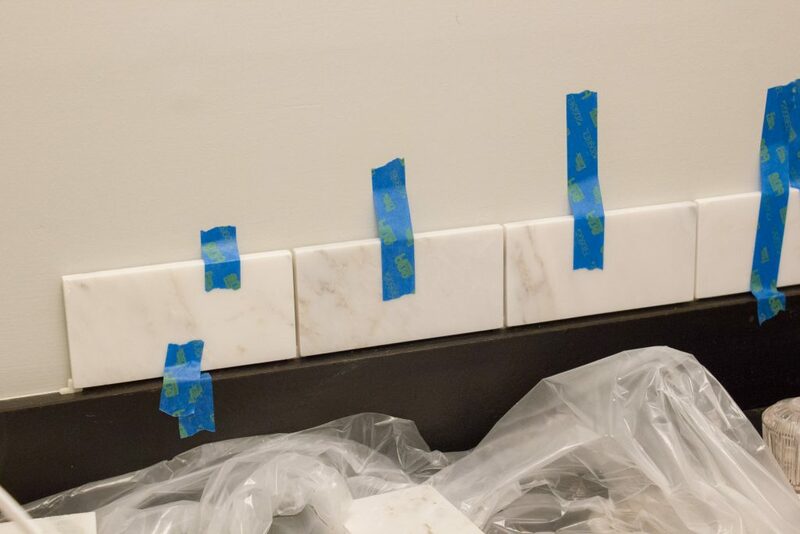 The notched trowel is too wide to fit in some of these spaces, so it’s easier to apply the thin set to the back of the tile, notch it, and stick it onto the wall. I did this in several areas and it has held up fine. 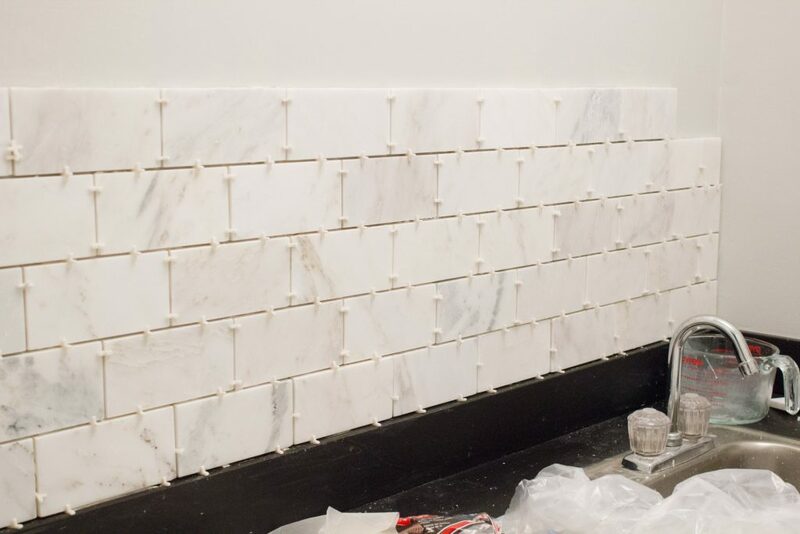 As I mentioned, I’m no expert when it comes to tiling, so be sure to do plenty of research before you take on this type of project for the first time. Hopefully you will find my tiling tips helpful if you do decide to tackle it. Most importantly, I want to say that if I can do this, so can you. 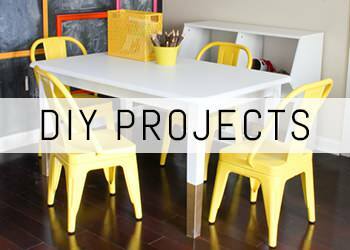 That’s sort of the whole premise of this blog, but honestly, this is a doable project. Tedious, yes. But doable. I’ll be posting soon about how to build the open shelves I made for the room, as well as how to hang shelves on the marble tile, as that was my next challenge, so stay tuned! 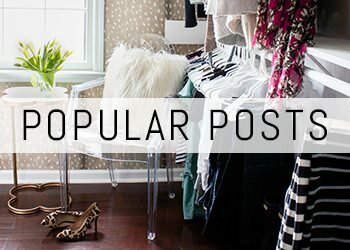 Love the post! 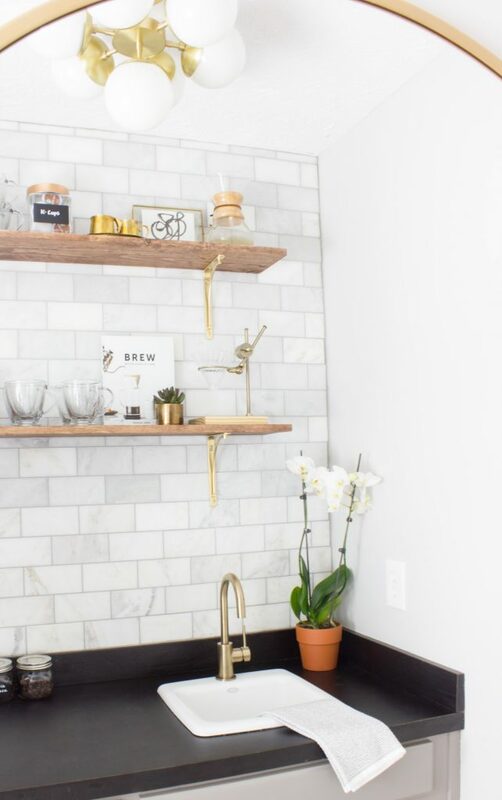 I’ve been thinking of adding a subway tile backsplash on my new kitchen and your tips were really helpful. Thank you so much!! I agree completely! I have done MANY sq/ft of tile, but never marble. I am doing a small bathroom in honed Bianca Carrara subway tile. 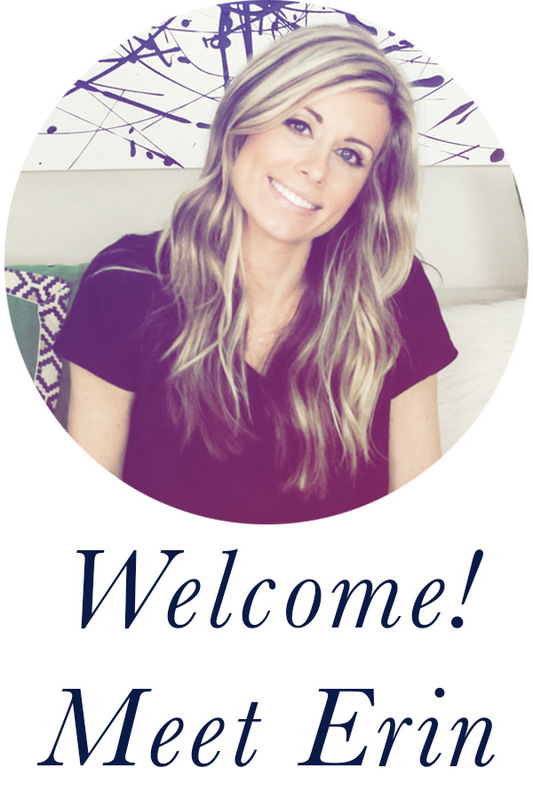 You detailed your experience perfectly – just what I needed! Thanks! Thanks, Patti! So glad you found the post helpful! Good luck with your project. Great post, Erin! Thank you! Have this tile for our kitchen but hadn’t yet selected the grout (your color is perfect IMO), nor have my husband and I had the courage to start the job. Your tips are most helpful. Thanks, Jessica! Glad you found this post helpful.